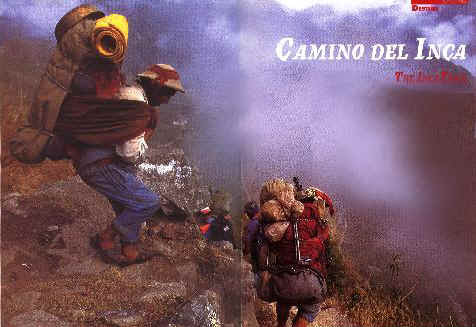 WALKING AT A STEADY PACE ALONG THE ANCIENT ROUTE TO MACHU PICCHU, WE RELIVE THE ADVENTURES AND MISFORTUNES OF THE OLD GUIDE WHO DISCOVERED THE INCA TRAIL AND MAKE FRIENDS WITH THE HUAYRUROS, WITHOUT WHOSE HELP OUR TRIP WOULD HAVE BEEN VERY DIFFICULT. HERE IS HOW WE MADE OUR DREAM OF REACHING THE FAMOUS LOST CITADEL COME TRUE, HOW WE WERE TO OVERCOME THE HIGH ALTITUDES AND REVISIT THE INCA PAST. we were welcomed as heroes." way down from the heights. Headed for Huayllabamba, with This remark Alfredo Sanchez, our 66-year-old guide, leads us off along the Urubamba River past Chilca, on our first day on the Inca Trail. "Nobody knew the way. We walked towards the Kusichaca River just like we're doing now, and then we climbed the gorge up to Huayllabamba" he continues. "From here onwards, nobody was quite too sure of what exactly lay ahead. In fact, we even wandered knew anything. The local people didn't even know what Machu Picchu was." Don Alfredo rambles on about his discovery. I settle for taking photos of the geometrically-shaped potato fields that lie in the Urubamba Valley, which the ancient inhabitants of the Sacred Valley used to call the Vilcanota. 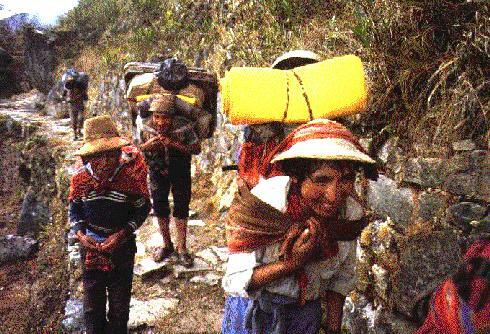 After a three-and-a-half hour walk, just before reaching the Llactapata ruins, we are met by a dozen grinning characters loaded with back-packs, pots and tents, who from now on will be our cooks and porters during the exhausting five-day trip. We stop. 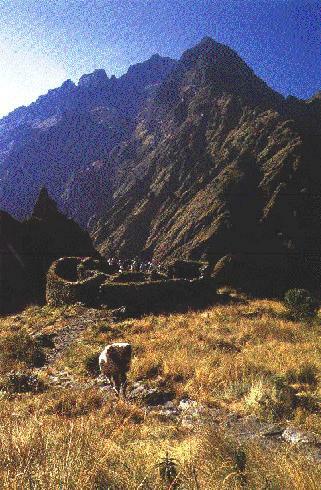 We are now overlooking Llactapata, the military check-point for all pilgrims headed for Machu Picchu. 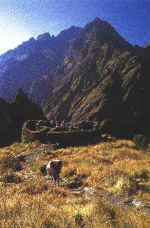 Its defense walls are perfectly outlined down below as we gradually lose sight of the Urubamba Valley. Towards dusk, we get the first glimpse of our campsite in Huayllabamba, Manco Inca It's last refuge from the hordes of invading Spaniards. 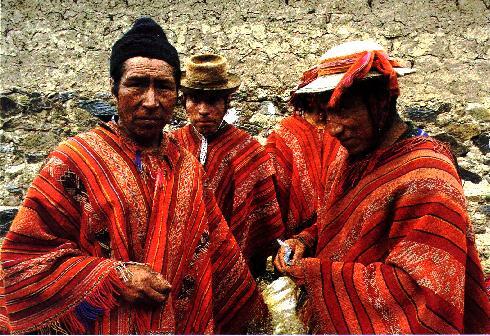 At night, under the bejeweled Andean sky, Don Alfredo recalls the misfortunes of an Irishwoman during the climb up to Warmiwañusca, about13,000 feet sea level, the highest pass on the Inca Trail. She was so shattered, Don Alfredo slung her over his shoulder and carried her for hours. The woman was so grateful, she wanted to marry him! Daybreak. Huayllabamaba fades away as we enter a forest of quenoas, bright orange tree that is only to found on the Andean heights. Here the trees are festooned with an epiphytic plant called salvajino, looking rather like beards against the bare bark. The quenoas of Llulluchayoc lend the spot a mystical air. We continue to climb, leaving behind ichu grass pastures and a long line of exhausted-looking hikers. At the top of the pass you feel like you're on the top of the world. Far below lie the depths of the Sacred Valley, while ahead lie a chain of bright green valleys known as the Valley of Silence. The faces of the trekkers who arrive one by one glow with the feeling of having achieved a glorious goal, a felling I share with them. Just then, a row of athletic porters jog past us, taking us down a notch or two. 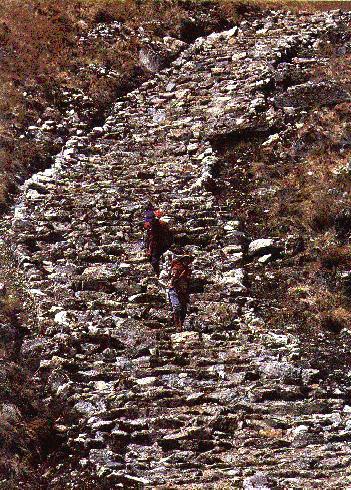 An Inca staircase which is as wide as a street takes us hundreds of meters down to Pacaymayo. 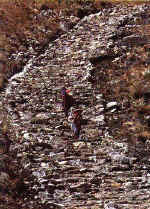 The Runcuracay Pass lies behind us, and with it the old ruins of the magnificent walls of Sayacmarca and those of Wiñay Wayna, which are often immersed in clouds. I am startled by how steep the stone steps which lead up to them, before they are engulfed by this green paradise. We walk for three hours or so through the forests that are teaming with orchids and are so full of life. We are serenaded by hundreds of parrots right up until we reach the Puyupatamarca ruins, where we will spend our last night before reaching the sacred city. The next morning, the trail is quite flat, bromeliads and orchids are all over the place. A long esplanade tells us we are about to arrive of at Inti Punku. I am elated. I cannot wait to see the amazing ruins of Machu Picchu. And there they are. Far below, looking majestic amongst the clouds and touched by the first light of day is the citadel, just beneath Huayna Picchu, its eternal guardian. I walk happily down a wide stone avenue, as I capture new angles of an old mystery. Entering the city, I come across Don Alfredo who is meditating on top of an enormous rock. "We won't have enough candles for the cake," he smiles. "This the 221st time I would have done this trail. How many times do you think Id have done it by the year 2005.